The former Gunners striker had worked with Arsenal's academy players last season during his course to gain his UEFA A Licence. The 38-year-old, who works on Sky's Premier League coverage and also appeared on the BBC's Euro 2016 output, was offered a role within the Arsenal set-up by manager Arsene Wenger - but was told he would have to step down as a pundit. Wenger has a history of aiding his former players, with Steve Bould currently his assistant and Freddie Ljungberg working within the youth ranks. Mikel Arteta, who retired at the end of last season, is also believed to have been offered a backroom role but decided to move to work under Pep Guardiola at Manchester City. 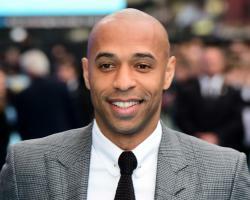 Henry is one of the top-earners at Sky since signing for the network in December, with former Arsenal skipper Tony Adams now believed to be set to return on a permanent basis. The ex-Portsmouth and Wycombe boss, 49, underwent heart surgery last year and has already been working with Arsenal's Under-18s in recent weeks. Wenger himself has several television commitments including a deal with beIN Sports but appears against members of his staff combining dual roles.